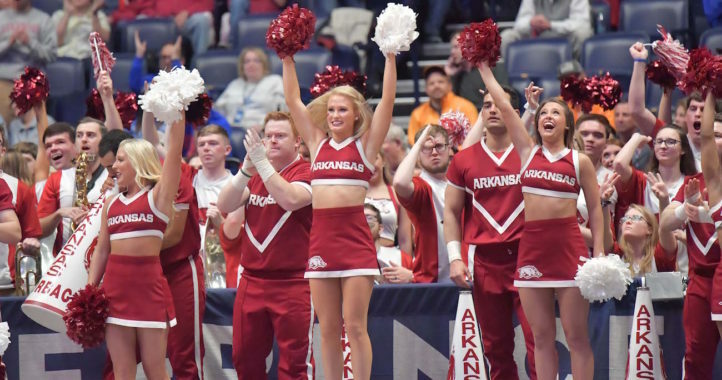 Among the reasons Chad Morris was hired at Arkansas, three things stand out — his ability to recruit, his longstanding ties to high school football in Texas and his ability to develop an explosive and wide open offense that scores points at the collegiate level. 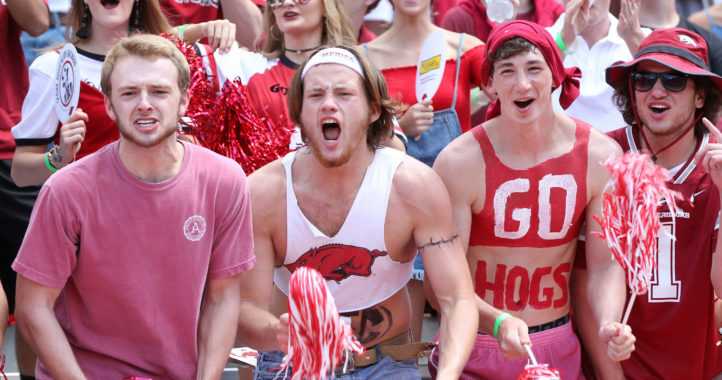 We’ve already seen the first two pay off for the Razorbacks, but in order for the third to become a reality in 2019, Arkansas desperately needed to significantly upgrade its quarterback room this offseason. 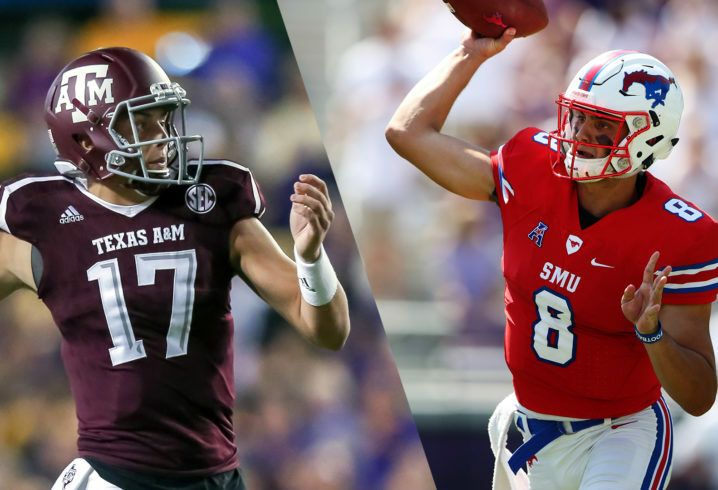 To say that goal was accomplished would be a massive understatement as the Razorbacks added two graduate transfers quarterbacks: SMU’s Ben Hicks and Texas A&M’s Nick Starkel. Both shared some up and down moments at their previous school. Both started as redshirt freshmen and also sat while other quarterbacks played. They each share traits, too, and here we will discuss the characteristics that each possesses that help them stand out from one another after reviewing nearly every snap each has taken during their college careers. Starting with Starkel, the son of a West Point graduate who served two tours of duty and a Navy nurse, the Argyle, Texas, native signed with Texas A&M after previously being committed to Mike Gundy’s Oklahoma State program. After taking a redshirt his first season on campus, Starkel beat out Kellen Mond to win the starting job in College Station entering the 2017 season. Starkel lost the offseason quarterback competition the following offseason once Jimbo Fisher arrived. That experience should serve Starkel well this summer as he participates in his third quarterback competition in as many offseasons. He will not be fazed by the challenge of trying to beat out Hicks. This is the best attribute Starkel brings is his consistent ability to hit receivers downfield and often throw his targets open when blanketed downfield in pass coverage. This skill becomes all the more valuable considering the Hogs’ coaching staff effectively worked tight ends into the offense last season. If C.J. O’Grady continues to progress and Hudson Henry lives up to the hype next season, Starkel’s ability to push the ball downfield should open things up for the team’s tight ends. The first example comes from Texas A&M’s 2017 game against Mississippi State. This was Starkel’s second career appearance and the first after sustaining an injury in the season opener against UCLA. That injury held him out for six weeks. He came off the bench in this contest, replacing Mond. Here is another great throw, at LSU with his team desperately needing a spark before halftime. Starkel delivers a perfect downfield pass to Christian Kirk, who is being covered tightly by a corner and a safety over the top. Had Starkel underthrown or overthrown this one much at all, he’s risking an interception, but as the saying goes, there’s no defense for the perfect throw. That’s what A&M had to have to complete this pass against this coverage. The Aggies scored a touchdown on the next play. Texas A&M’s offense featured one of the nation’s best playmakers in 2017 season, but unfortunately for Kirk, Mond wasn’t consistently capable of getting him the ball. That certainly wasn’t the case when Starkel was in the lineup. During the 6-game stretch Starkel missed due to injury in 2017, Kirk caught 24 passes for 300 yards and 5 touchdowns. The next 6 games, with Starkel in the lineup, Kirk was truly able to showcase his ability as a receiver as he hauled in 42 passes for 559 yards and 5 scores. Starkel’s third career game came at Auburn in 2017. He didn’t start, but his performance was enough to impress Kevin Sumlin and Noel Mazzone, who named him the starting quarterback next week against New Mexico. However, that’s not to say Starkel was without some misfires against the Tigers. One series ended in only 3 points for the Aggies when Starkel failed to convert in the red zone. On both 2nd-and-goal and 3rd-and-goal, Starkel failed to give his receiver an opportunity to make a play on the ball here. Later in that same game, Starkel did the same by badly overthrowing one receiver on 2nd-and-goal and on 4th-and-goal, throwing the ball into the ground. At the very least, Starkel should have forced the ball into his receiver to give him a shot at a catch. Down two scores late in the game and in a 4th-and-goal situation, an interception and an incompletion hurt just the same. He has to at least give his players an opportunity to make a catch in these situations. While those attempts might have been poor, Starkel progressed to the point where he was making those plays on the road against SEC competition. On a very similar situation and with a rowdy crowd buzzing in anticipation for a stop, Starkel delivers a dime to silence Death Valley. This is obviously Hicks’ biggest advantage in the quarterback competition. He started in Chad Morris’ and Joe Craddock’s offensive scheme for two seasons at SMU. If you were unaware, Hicks was not SMU’s starter at the beginning of the 2016 season, but due to a season-ending injury to senior QB Matt Davis, the redshirt freshman was thrust into the starting role. Hicks wasn’t overwhelmed. He appeared to have a good grasp of the system going back to the 2016 season. Neither Ty Storey nor Cole Kelley appeared to fully grasp the offense last season and it’s complicated enough that is seems very unlikely a true freshman could come in over the summer and earn the starting role. How realistic is it to expect Starkel to show up and have the system down by late August? The offense A&M ran under Sumlin and the high school offense Starkel ran at Liberty Christian are similar to what Arkansas is running, so there’s reason to think he could pick it fairly quickly, but it seems very unlikely Starkel would manage to surpass Hicks in this regard this fall. Given the protection issues Arkansas has had and the lack of elite offensive linemen on the roster, it’s likely the QB will be working behind a suspect offensive line. While that’s obviously not ideal, Arkansas would be wise to make the best of that situation if Hicks wins the job and move him around. While Hicks is by no means a threat to gain many yards on the ground, he is very effective as a passer when rolling out — particularly when running to the right side of the formation — and he does a terrific job of keeping his eyes downfield under pressure. That quality might not seem that valuable to some, but at all levels of football, most quarterbacks struggle to deal with the threat of getting hit. Here’s an example of Hicks keeping his eyes downfield after the protection breaks down. Against a ranked TCU team in 2017, Hicks evades the pass rush and deals with the threat of getting hit in the mouth by an unblocked TCU defender. Hicks delivers a perfect pass to a receiver in stride for a nice gain. When Hicks first announced his decision to leave SMU and Arkansas was mentioned as a potential transfer destination, the first thing that jumped out was the fact the former Mustang was the school’s all-time leading passer after only three seasons on the field. While that’s very impressive, upon further review, Hicks likely would not have come anywhere close to that record if he didn’t have Courtland Sutton for two seasons and Trey Quinn for another. After watching Sutton in action for the first time at the college level, it was easy to see he was the best player (on either team) every time SMU took the field. His two seasons catching passes from Hicks, Sutton racked up 144 catches, 2,331 receiving yards and 22 receiving touchdowns. During the 2017 season, Quinn had an incredible 114 catches with 1,236 yards and 13 receiving touchdowns. That’s not to suggest any quarterback could have gotten them the ball — give Hicks credit for that — but his record-setting numbers seem inflated knowing he had those players to work with. Once both receivers left after the 2017 season, Hicks had his worst season and was benched during SMU’s 2018 campaign. If you need some yards on the ground in a pinch, Starkel is not your man. During his career, he has minus 48 total rushing yards in two seasons. To run his offensive at the highest level, Morris needs to find or develop a quarterback who can do both (KJ Jefferson could eventually be that guy), but while Starkel isn’t going to extend plays with his legs, he does have enough movement in the pocket to not be a complete liability. Following Jimbo Fisher’s hire in College Station, while he had not taken over the coaching responsibilities for the Aggies in the Belk Bowl, he had observed the team’s practices leading up to the game. He also served as a guest analyst for a few segments during ESPN’s coverage of the game and shed some light on what he sees from Starkel in the pocket. During this segment, he complimented Starkel on his mobility within the pocket, which can be an overlooked trait. While we have noted that Starkel does have great accuracy down the field, having deep field accuracy and possessing elite arm talent are two different traits. That’s not to say Starkel can’t get it done, but there are some throws he has struggled to make during his Texas A&M career. Most notably, Starkel hasn’t shown the ability to throw the deep out. Not being able to complete this pass isn’t a complete indictment of Starkel’s game, it’s one of the toughest passes to complete, but it potentially limits what the offense can call. It might not entirely be fair to critique Starkel for this aspect as he only saw meaningful action in one season, and he got hurt and missed half that season. When you also factor in he was a freshman and playing for a coach on the brink of being fired, the pressure might have been unfair for even A&M’s most veteran of quarterbacks in 2017. Be that as it may, Starkel’s only wins as a starter came against a 3-9 New Mexico team and a 6-6 Ole Miss team that was banned from postseason play. He had opportunities to lead the Aggies to wins over Auburn, LSU and Wake Forest in the bowl game but couldn’t deliver those results. What happened in previous seasons isn’t likely to hurt Starkel when it comes to how the Arkansas coaching staff evaluates him, but they know what they are getting in Hicks and if the competition is close, the Razorbacks may give the nod to Hicks based on experience on the field and in their offense. After watching his performances spanning three separate seasons, Hicks appears to be the same player at the conclusion of the 2018 season that he was at the beginning of the 2016 season. There have been some ups and down in between, but there was no substantial difference in performance based on what I’ve seen, which is concerning. Last season during his junior season, Hicks’ first 4 interceptions were all pick-6s. I can’t recall many successful quarterbacks that have multiple pick-6s in a career, not to mention in a single season and after starting for three seasons. Neither is a legitimate run threat. Hicks has rushed for minus 104 yards in his three-year career. (Sacks count against rushing totals.) SMU often sat Hicks to brought in a Wildcat “quarterback” to have a running threat at the quarterback position. While that proved to be effective at times, it limits what this offense is capable of doing when coaches are forced to bringing in special packages to challenge defenses in his aspect. The strongest part of Hicks’ passing game is his solid short-field accuracy. He consistently showed the ability to complete passes within 10 yards of the line of scrimmage but when asked to challenge down the field or over the middle, he appeared to be very streaky. The best example I could find came in SMU’s 2016 game against South Florida. Hicks started 13-for-13, including one of the better deep balls he had during his time with the Mustangs. Then things eventually went sideways. That was something that appeared to plague Hicks during his SMU career and really showed during his final season when he didn’t have any elite receivers to target. After taking in the careers of both players leading up to the 2019 season, it wouldn’t be much of a surprise for Hicks to win the competition to be the team’s starting quarterback at some point during fall camp. That being said, it is going to be really tough for the coaching staff to keep Starkel on the sidelines if the program is going to reach its full potential next season. It will be important for Morris and his staff to make the right decision and stick with it, as last season’s yo-yoing of quarterbacks resulted in disaster on the field. If Starkel has a firm grasp of the offense come next fall, Arkansas would be wise to turn the keys of the offense over to the former Aggie. Either are better than the options we had last year. I have little doubt Starkel will be able to grasp the offense. He’s a pretty smart kid. I think he had been accepted into Yale and West Point out of High school. I would not mind if he has a hard day September 28th. Other than that, I wish him all the best.